the Photos In A Minute Photo Booth kiosk packs a lot of social media power. Your event guests can upload their Photo Booth pictures to Facebook and Twitter, email them or Text to Phone to everyone! Additional social media kiosks can be linked to the Photo Booth so your guests can take their time uploading photos without slowing down the line. Photos In A Minute offers a stylish appearance and cutting-edge technology, all packed into one small product. Whether you’re providing entertainment and party favors to your clients, guests or employees, a Photo Booth is a great addition to any corporate event. 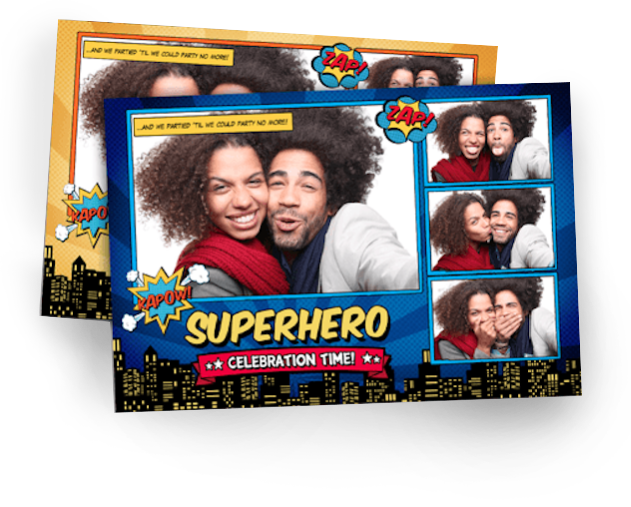 Photo strips can be custom-branded with your company or event logo, The Photo Booth can be covered in a custom vinyl wrap with graphics of your choice. You can use an existing space, one of our backdrops or a custom step and repeat for the photo booth background. Your next company party or corporate event will be a sure success with a Photos In A Minute Photo Booth rental. Whether you’re providing entertainment and party favors to your clients, guests or employees, a Photo Booth is a great addition to any corporate event. Photos In A Minute offers a stylish appearance and cutting-edge technology, all packed into one small product. Print-outs are available through a separate printer kiosk, connected wirelessly to the Photo Booth. Photo Booth can be connected to external power and can act as an energy buffer. It can operate for 4 to 5 hours without external power. If you are using the Photo Booth for photo marketing purposes, you can brand the booth and photo strips with your company logo. You can also tag photo uploads to Facebook and Twitter with your custom hashtag and program the booth to collect email addresses for future marketing campaigns. Along with its sleek and modern design, the Photos In A Minute Photo Booth kiosk packs a lot of social media power. Your event guests can upload their Photo Booth pictures to Facebook and Twitter, email them or Text to Phone to everyone! Additional social media kiosks can be linked to the Photo Booth so your guests can take their time uploading photos without slowing down the line. Photo Booths can be FULLY BRANDED per event. Green Screen, print onsite, custom backgrounds. Slow Motion Video with Animated GIF. Attract video or video host capability. Slideshow, video, GIF slideshow, Instagram slideshow. WE'VE RECEIVED MANY QUESTIONS. HERE ARE SOME OF THE MOST POPULAR. How do I benefit from the Photos In A Minute Booth? In two words: Sales and Marketing. With just a few bookings, the booth will pay for itself. At every event, you have the opportunity to introduce your brand to hundreds of potential clients. Put your brand on the photo strip or video clip and guests will distribute your work on social media. Does it make sense to have an attendant at the booth? This is your chance to capture your audience and introduce them to your brand. Just think of how many potential clients you will meet - it's a spectacular sales opportunity. Although there is a lock on the back, it's always a good idea to have some supervision around expensive equipment. Is the booth easy to set up? It really couldn't be easier: booth enclosure (computer, lights and camera), stand, and base all fit into one hard case with wheels. It fits easily into the trunk of a car. The set-up time is just about 3 minutes. Does the booth come ready to use straight out of the box? Yes. Just set up the computer with your own preferences and you are good to go. Does the booth do green screen? Yes. The software does include some digital backgrounds to use with the green screen function, but you can always import your favorites. Does the booth shoot video? Yes! You can record clips of up to 60 seconds with slow-motion playback options. What if there isn't any WiFi where I am setting up the booth? If you can’t connect to wifi, the software puts users' information in a queue. Once the computer reenters wifi, it will process all media in the queue. The computer will last about 6-8 hours on a full charge. The lights will run for about 5 hours, while the camera will run for about 3. It is always a good idea to have extra batteries for the lights and camera. You can always plug the components in if you prefer not to deal with batteries.